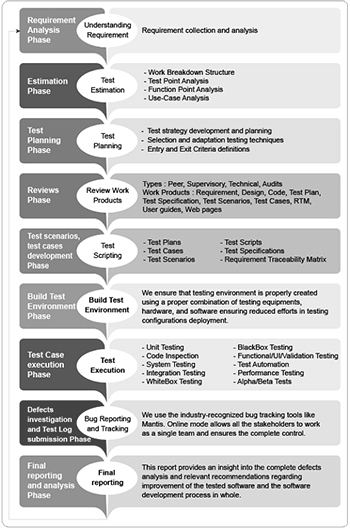 Software testing is the process used checking the quality and performance of an application or product under the development process. Ann application needs to be flawless in its operation without being compromised on any grounds. Hence care is taken that the application is tested through the most rigorous conditions and the effect is as good as the client wants it to be. Any failure in its operation can be deemed as a cause for the fall in our client’s reputation and it can be avoided if proper software resting is done. The process is considered to be very crucial in determining whether the whole development process was a success or a failure by comparing the functionalities and features of the product to the requirements mentioned by the client. Moreover, it also verifies the real world application feasibility of the developed solution along with all its characteristics. Allesoft employs multiple skilled and genuinely talented software testing engineers working tirelessly to deliver error free deployment of our software testing services. We work using the most superior software development techniques and testing services to provide software solutions that have time and again proved to be the benchmark to our clients in shortest time duration. However, an extensive discussion with client is conducted before the testing actually starts to keep the client aware of all the options he might need to exercise while giving clear emphasis on advantages and disadvantages of each. Allesoft has a proven track record and loads of experience in software development and software testing delivering highly robust and business centric software solutions to more than 500 clients, all of them being prestigious in their areas of operations spreading across diverse geographic locations on the globe.